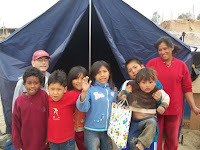 Thanks to all of our tent customers for your patience during our large scale humanitarian earthquake relief effort that we spearheaded in Peru towards the end of 2007. Our entire stock of camping tents was shipped to Peru to help provide temporary housing for the victims of the earthquake. Our customers were very understanding about us being out of stock on tents that they needed and were very patient while our tent factories manufactured more tents for our warehouses. We now have all of our canvas tents, wall tents, cabin tents, canopy tents, and dome tents back in stock and will produce more as needed. Pinnacle Tents thanks you again for all of your support during our involvement in this relief effort. At this point in time are there any upgrades planned for the 4 room cabin tent for 2015? I am considering buying this tent next year. I would like you to add an extra hardware kit ( a sampling of all plastic pieces, nuts, bolts if one is not available I would have you make me one from scratch and I would pay you for it. I am not saying anything is going to happen or your product is bad but I like being prepared for slight emergencies . We have completed all the upgrades that we planned. We stock parts for the frame of this tent.